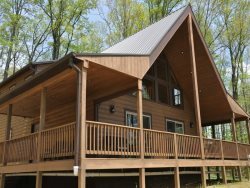 Get away from it all at Stargazer at Deep Creek! Soak in the hot tub and listen to bird song in the wind swept trees. Fire up the charcoal grill for your cook out favorites. Waterfalls, hiking and fishing are just minutes away. Clean and cozy, Stargazer at Deep Creek is minutes from downtown Bryson City and the Great Smoky Mountains Railroad. The Deep Creek area of the Great Smoky Mountains National Park is about a mile from the cabin with hiking, tubing, and fishing. Explore the mountains and find three beautiful waterfalls at Deep Creek. 2 Bedrooms and 2 Baths: The Main Floor Bedroom has a view, a Queen Bed and a Private Bath. The Second Bedroom upstairs has a view, a Queen Bed and Private Bath. Both bathrooms have tub and shower combinations. Fire up the gas grill to enjoy your favorites. Soak in the hot tub on the open deck and enjoy gazing at the starry sky. Stargazer at Deep Creek is about 9 minutes from The Great Smoky Mountains Railroad. White water rafting, zip lining, and horseback riding are just a 20 minute drive from the cabin. The Sequoyah National Golf Club and the Smoky Mountain Country Club both less than 20 minutes away. Ruth’s Chris Steakhouse and Brio Tuscan Grille at Harrahs Cherokee Casino and Event Center are about 25 minutes from the cabin. Staff was very friendly and knowledgeable. We have used GSCR for our last three stays in the Bryson City area. we loved the view here! Thank you for a wonderful stay in your cabin. We celebrated our 22nd Anniversary here and we couldn't have had a better, more relaxing stay. We'll be back! The cabin is very beautiful and private. I recommend following the direction given by the host and driving during the day but the cabin was clean, beautiful and peaceful. Had a wonderful relaxing time. The cabin was very relaxing, clean, and a very enjoyable place to stay. We greatly enjoyed our Honeymoon here in North Carolina, a large part due to this cabin. We had such a fun time, we wanted to stay another day. Thank you for being so accommodating and letting us do so. Lovely cabin equipped with everything in a GORGEOUS location!! The sunrises were amazing! We loved the view. We enjoyed the National Park. The cabin was very clean. GSCR is very professional. We had such an amazing weekend celebrating my best friends birthday. From the amazing views to the relaxing Hot Tub, this place did not disappoint. We explored downtown and the surrounding scenery. Thanks for a much needed weekend getaway! Everything was clean and ready for us. We enjoyed the hot tub and being able to eat out on the deck. We went hiking and enjoyed the hot tub. Thanks a lot for the cabin, we had some really good times here and what's better than a Jacuzzi after a long hike. We really enjoyed our first stay in the Smoky Mountains. We were glad to discover the fall colors. The pans were really good quality, we were able to make crepes in the morning - we are French, so it was really perfect. Loved the cabin. We went for the eclipse and it was outstanding. We were given information on the area and when we arrived an eclipse gift bag. The view and the solitude were great with just a short ride to Bryson City for meals and shopping. I would arrive during the day for your first ride up the mountain. We spent a week here in this cabin. It was so beautiful and the perfect setting to relax for summer vacation with the family. We had a blast with "Ride the Rail"and white water rafting. We made lots of great memories. We spent a week in the Stargazer Cabin and had a wonderful time! Such a beautiful and peaceful setting to relax for summer vacation. We had a blast with the "Ride the Rail" and white water rafting. We also enjoyed tubing. We can't wait to come back again. From the back porch you have a nice view of the mountains. We really enjoyed our mountain vacation and staying in this cabin for a few nights. It was our Spring Break family time. Our favorite places to visit were Deep Creek, Nantahala river, NOC, and the Cooper Creek Trout Farm. Our 2 year old grandparent loved it! We will be back again soon. We had such relaxing couple of nights in the Stargazer cabin. The sunset and sunrise from the back porch is amazing! It was very peaceful. We asl enjoyed the Deep Creek trail and Juney Whank waterfall. Our dog enjoyed playing and exploring as well. We will definitely revisit, thank you for the lovely stay. Nothing but friendliness and an "aim-to-please" attitude. Such a wonderful place to relax. We enjoyed the back porch and scenery!. Gorgeous setting here in the Great Smoky Mountains. Cabin was very clean. Everything so accommodating. Thank you for such a wonderful cabin. Very quick to call back and help me with my concerns of my pet and checking in late night.